Do you enjoy having plants, but don’t have enough space in your tiny urban dwelling? Are you interested in growing at least a little bit of your own food? Want to get into hydroponics or aquaponics, but you don’t know where to start? Come to the Windowfarm Workshop this Saturday to learn to build a DIY hydroponic garden that fits in a window. 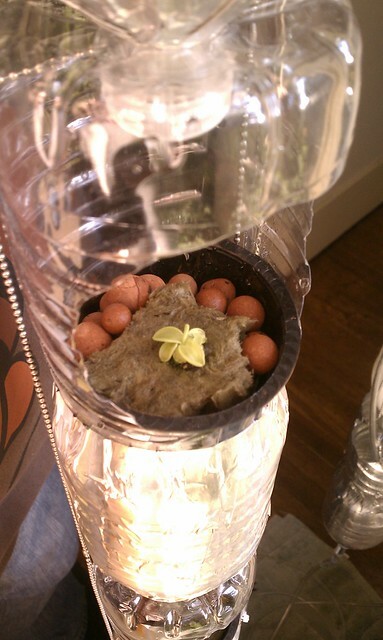 We’ll be following the Windowfarms.org plans using 1.5 L recycled water bottles, and an aquarium pump. It will be a two part workshop. The first session, this Saturday, June 11 from 2-4pm, we will be putting together one bottle-planter, reviewing the required materials, and what you’ll need to assemble before the second workshop. You’ll have a little over 2 weeks to get collect the parts you’ll need locally. The second part to the workshop, on Tuesday, June 28 from 7-9pm, will be putting it all together and testing the system. Together, the sessions are $70. We look forward to having you join us to get your grow on. Check out this set of pictures for an idea of what a local installation looks in process.